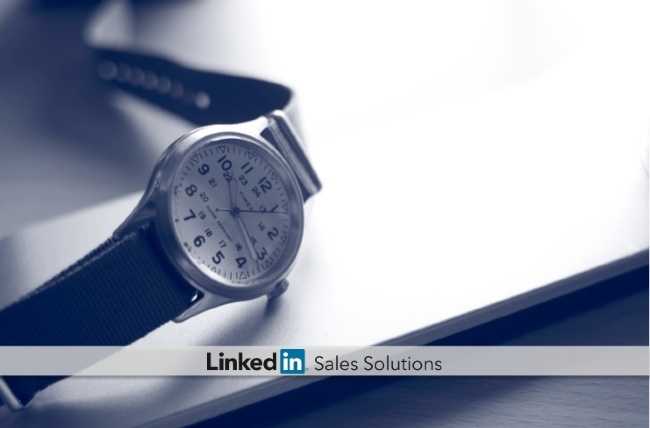 Boost your sales productivity skills and reclaim control of your calendar with these 4 time management tips from LinkedIn Sales Solutions. Time management is a unique factor for many sales professionals. Some pros are able to deftly maneuver through their tasks, starting each month over quota while calmly working on the months ahead. Meanwhile, those who struggle start each month from scratch and scramble until the last minute to avoid falling short. We all like to think that companies follow the Gregorian calendar in their budgetary process, but January isn’t always the start of a new fiscal year. Your prospects may be in budgeting cycles at varying times throughout the year. Knowing when budgeting cycles happen for your prospects will ensure that you provide any needed information to help them secure budget in the following year. Proactive communication is the simplest way to stay aware of your prospect’s priorities. Today’s sales pitch is a perpetual event – don’t stop selling just because the phone call ended. Planning ahead can prevent unexpected tasks from popping up and taking time you hadn’t allocated. What events are exciting your prospects? Remember that event attendance can trigger further prospect participation – so pick the events that have the greatest lead generation potential. In addition, expand your view of events. Events can be industry conferences, but they can also be internal company events. This includes such things as product roll-outs, location expansions and new hires. All of which shows can trigger new purchases. By leveraging LinkedIn to stay connected to your customers, you can use real-time data to identify the “triggers” that may just be the insight you need to close a sale. You are the best barometer for determining what works well for you, so identify and plan the activities that will ensure you are effective at reaching goals. By understanding your natural cycle over the course of the day, you can plan activities accordingly. For example, if you are naturally more energetic and personable in the morning, plan your follow-up calls for this time. It only make sense that you might get further with prospects when you are in the moment and able to persuade them to the next step in the sales cycle. Not ‘feeling it’ immediately after lunch? Then, plan activities such as completing paperwork or expense reports for this time. You will be amazed at how better scheduling can improve your productivity as you move from task to task. We’ve all felt the strain of time on our shoulders. Without a plan for time management, it can feel like you’re always behind. Try these 4 sales productivity tips to reclaim day and establish a plan for more proactive, effective interactions with prospects.